How do I make my child smarter? Maybe your child has an important test coming up… maybe your child is struggling in a certain subject at school… or maybe you’re just a great parent! How can you make your child smarter? That is so so so true. But what does it have to do with education? Frankly, it’s less about education and more about motivation. This is the key takeaway from the quote: people are exponentially more productive, creative, and effective when they are doing something that they long to do. If you can inspire your child to want to learn the thing you need them to learn, they will be able to learn that thing much faster. What is the most boring thing in the world to a 5-year-old? Algebraic chess notation. You miiight be able to find something else that’s equally boring, but it’s impossible to find anything that would bore a 5-year-old more than algebraic chess notation. And yet, all Chess at 3 students love algebraic chess notation. Love. They don’t tolerate it. They don’t do it to receive a reward. Algebraic chess notation is the reward. King Chompers and King Shakees love to play chess together. Every day, they have a playdate outside until, one day, a bad king moves in next door. His name is King Deboulajae, and he sees King Chompers and King Shakees playing chess. King Deboulajae doesn’t want to learn the rules of chess and he wants to win every game. King Chompers tells him this isn’t how chess is played. Then, King Deboulajae bans chess and takes away their chessboard. Oh no! King Chompers and King Shakees need to find a new way to play chess. First, they try drawing chessboards on their windows, but King Deboulajae paints all the windows black. Then, they try drawing a chessboard on a piece of paper, but King Deboulajae finds the paper and tears it into teeny tiny pieces. Oh jeez! Their plans didn’t work, but King Chompers is not giving up. He’s determined to find a way to play chess no matter what. Then, King Chompers notices something on his backup chessboard. The chessboard has letters on the bottom and numbers on the sides! 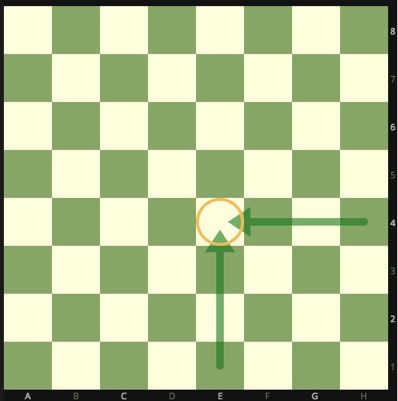 Maybe King Chompers could just write “e4” on a piece of paper, and King Shakees would figure out that he wants to move a pawn to that square as his first move! King Shakees is able to figure out the secret code because he’s a chess player. 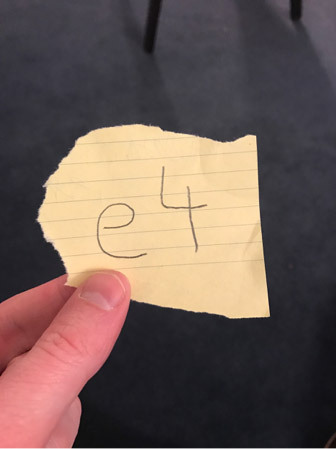 He makes his own note that says “e5.” King Shakees is so excited to take the note to King Chompers. But as King Shakees is delivering it, King Deboulajae catches him! King Deboulajae studies the piece of paper, but he can’t figure out the secret code because he’s not a chess player. He thinks “e5” is a recipe for fancy potatoes and boom! King Chompers and King Shakees have figured out a way to play chess in secret. Now, the children are chomping at the bit to try out this “secret code,” all because of a story. Be creative and show real world applications. Stories can inject meaning and life into the most ‘boring’ subjects. But people will also learn things if their environment demands it. If a child is struggling in math, find math in what they already love. Do they love baseball? Depending on the age of the child, you can find math everywherein baseball. Don’t ask trivial questions that your child doesn’t care about like, “There are 9 players on the field at a time. If I had 4 fields, how many players would be on them?” That’s just an arbitrary mental exercise. No one cares. Instead, try something like, “Oh man, Frank Thomas just struck out! How many more players have to bat until he gets a chance to try again?” That’s a real question that has some math behind it! If your child is older and dealing with statistics, you can create a competition around predicting different things in the game, like the number of hits or the final score. You can use statistics from past games and factors from the current game. “Use the natural world around you to prove to your child that learning this information will be worth it. We would love to hear about any paths you uncover to creatively inspire your child’s learning. Tell us about it in the comment section!